Many people come to Hawaii to heal – whether they are just getting out of a long relationship, grieving over someone or something lost, or getting over an illness or major life change. In any case, Hawaii is known as a healing place, as explained by many scientists, including Richard Hoagland. Most people who have experienced healing life changes in Hawaii may also relate their recurring dreams and early childhood memories back to an ancient civilization that they may have been apart of called Lemuria, also known as the Continent of Mu or Motherland Mu. Many people are called to pay homage to Pele the Volcano Goddess to help them heal. I met a Canadian woman who was visiting on a VISA, but overstayed her time because she was told to visit the Volcano Goddess of Kilauea. Many people have deep spiritual experiences as they bring gifts of flowers, food, gin, and cigars to the Goddess of New Earth…it’s their hearts that Pele acknowledges. When you come to Hawaii to heal, come with humility and openness to the etheric healing powers, expecting to heal from the inside-out. Many people are also called to pay their respects to Pele’s sister, Poli’ahu, the Goddess of Mauna Kea – the tallest mountain in the world, located in North Hawaii on the Big Island. Also known as an ancient vortex of the historic Lemurian culture, the Hawaiians always paid homage to Poli’ahu as they prayed for the rain waters to keep their crops green and communities fed. I’ve had amazing experiences at the top of Mauna Kea, from seeing numbers and stars align, to seeing orbs fly into my truck, and into my Lemurian seed crystals while the doors were locked and windows shut tight. I had gone up there alone to get answers to my life and came down with more than expected…truly a healing experience. There’s also a healing lake that many Hawaiian Kahuna and World Shaman’s visit near the top of Mauna Kea that offers mystical experiences as well. As part of the prophecy for December 21, 2012 and the end of the Mayan Calendar, Mauna Kea is considered an ancient vortex that is being triggered open for these times. The Maya, Inca, Tibet, Hindu, and Aztec civilizations originated from this large Pacific continent of Lemuria that sank over 13,000 years ago, back before the times of Atlantis. The islands also offer healing retreats with many types of naturopathic and holistic modalities, including salt water cleansing retreats, yoga retreats, spiritual retreats, and vegan-organic retreats. There are also vacation rental homes and bed & breakfast estates that offer healing labrynths, medicine wheels, and organic fruits and vegetables that are grown on site, so you can experience a natural way of living and healing in a safe, grounded environment. My cousin lives in northern Calif. and has come many years to Big Island conducting women’s retreats at Kealakekua Bay. They time it when the dolphins are there so they can have that magical experience. Everyone leaves feeling blessed and better than when they arrived. Thank you Carol! Yes, Author Joan Ocean does the Dolphin therapy swims with people from all over the world, along with many other Healers who come to the islands to experience our cetacean family energy. The dolphins are amazing creatures and there always seems to be a spirit transformation for any who experience their presence. Thanks for sharing Carol! I would absolutely LOVE to talk with you further as I continue contemplating relocating to Hawaii… wow… feels so so right… especially after learning of the connection with Lemuria… could you please give me your direct email and or phone number? Here’s mine: laurasilvina17@gmail. I REALLY hope we can connect. This is a wonderful blog, Claire! Looks like I need to book a flight to your island real soon, thanks! 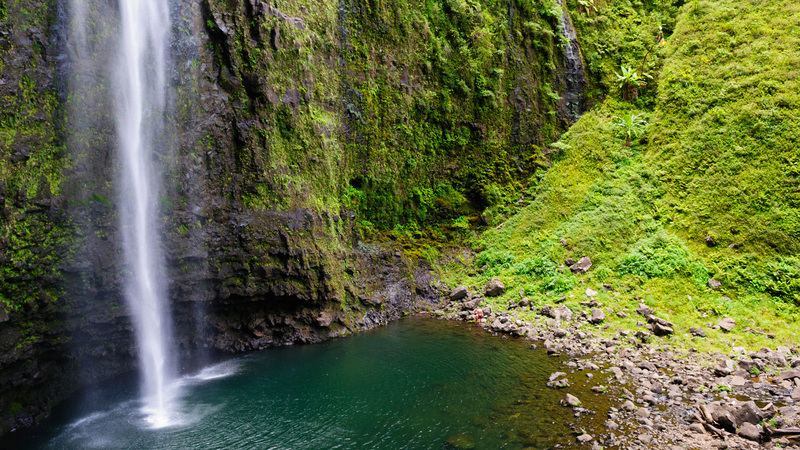 Is there something very spiritual about Kauai then the other islands? I cry with a deep connection to God when I get there and more so when I leave. Feels like I’m leaving that strong overwhelming connection! Wonder if you know anything about this . Thanks. Aloha Shaylyn! Can’t wait to see you! And I want to visit you on Kauai as well! Kauai is also a very mystical healing place and I’ve had amazing spiritual experiences there.. watching a rainbow form above me, seeing heartspray at Spouting Horn, seeing rare birds dwell above me, along with the deep experiences I’ve had with Love there.. all of the islands have their special healing power, and Kauai definitely has it’s own magical power to experience! I want to go hiking with you soon Shaylyn! Sunshine has magical healing powers for me, when I remember to slow down for a few minutes and just lay back and rexlax and….ahhhhhhh. Love living here on the Big Island. I love you Pat! Thanks for reminding me too, to slow down.. relax.. and stop to smell the Hawaii roses too.. appreciate every experience we are having! And you’re right, the Sun is definitely a Healing factor here.. I’m sure that’s partly why at least 19 Billionaires have homes on the sunny West side of the Big Island [besides having great golf weather]~ Vitamin K makes for a great disposition! Thanks Pat! I am wondering how I can find a true and honest kahuna? I am currently the victim of black magic and am in dire need of healing or guidance for self-healing. Any advice will be appreciated. First I would engage in a good ol’ fashion smudging. All things not of the light can be asked to vacate and not return if their purpose is not based in the light. Be honest in your intent and believe all things are possible. Hi, Claire. Me and my husband just came back to Houston, TX from Hawaii. We visited three islands, Oahu, big island, and Maui for 6 days. Big island is our favorite. We enjoyed air, water, jungles, beaches, volcano, local foods, fruits and juice, and fish. We both feel energized and healthier after returning. I’m wondering if this island has some amazing healing power. For this reason, I searched and found your site. I’m considering the energy somehow comes from the black stones and black beach, even volcano. Black is a color that absorbs energy. It’s just what I feel. I’m still curious about it’s healing power. Can you give me some references? One place that may resonate is a healing center where many seekers live, do seva (selfless service), & teach and take workshops with global healers much like you. Check it out for yourself~ http://kalani.com. Hi! Very happy to have found your blog! HI has been calling me!! Any thoughts/comments on Maui? I’m grateful to be able to call Big Island and in general, Hawaii my home. Anytime I feel like I need to leave (because of the 3D world’s lower vibrational energy/responsibilities), I’m reminded that I’m here on the islands to experience healing and to raise my consciousness.